Bathe in the lap of luxury every morning with some of nature's finest ingredients. 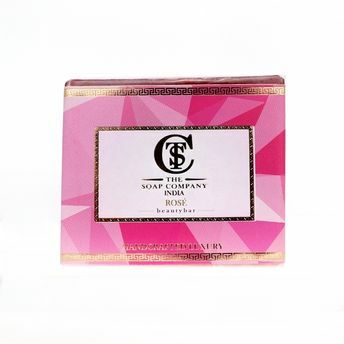 The Soap Company India Handcrafted Luxury Rose Soap is an incomparably exquisite beauty bar enriched with moisturizing vitamin E oil, Goat's milk, Almond oil & extract of Rose flower. It rejuvenates dehydrated skin, tones and adds a healthy glow to skin, it will also delicately scent your skin whilst you shower. About the Brand: The Soap Company India has been set up in order to empower women of India by offering maximum employment. Their handmade products uses traditional methods in its making and adheres to the high standard of purity, authenticity and quality. The company has a team of experts that create effective products that are made with love, care, purity & serenity while contributing to the society we live in. Explore the entire range of Soaps available on Nykaa. Shop more The Soap Company India products here.You can browse through the complete world of The Soap Company India Soaps .